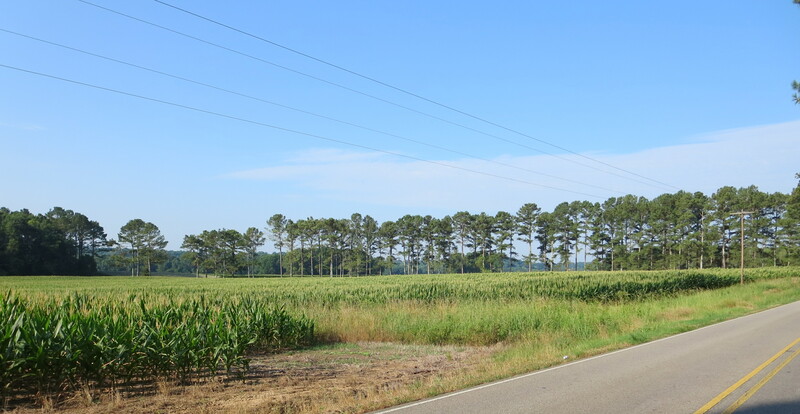 Having lived in the deep south a couple of times the idea of a hundred mile ride in Alabama, in late June seemed a bit suspect, but the Iron Mountain Challenge fit nicely into my budget and calendar so I made the commitment for it to be my ride. I mean it’s northern Alabama, in the “mountains” and surely they wouldn’t schedule such a challenge in overbearing summer conditions, would they? Saturday morning dawned with bright sunshine, deep blue skies and absolutely no wind, Not even enough of a breath to shake a blade of grass, and that’s as windy as it would get all day, so the 75 degrees and 80% humidity was already stifling as I made the short drive from hotel to starting point. Uh, I guess they just might schedule this ride in overbearing summer conditions. In yet another boneheaded blunder, which I seem to suffer far too often, when I got to the registration table to pick up my number and timing chip (small aside here; this is one of the few rides I’ve done which has had actual timing chips. Classy) I discovered that both of my water bottles were still chilling, in the fridge,…in my %*&^#**& hotel room!!!!! Somehow I was extremely lucky as a ride volunteer, I believe her name was Wendy, managed to provide me with two brand new bottles, saving my day. THANK YOU so much! 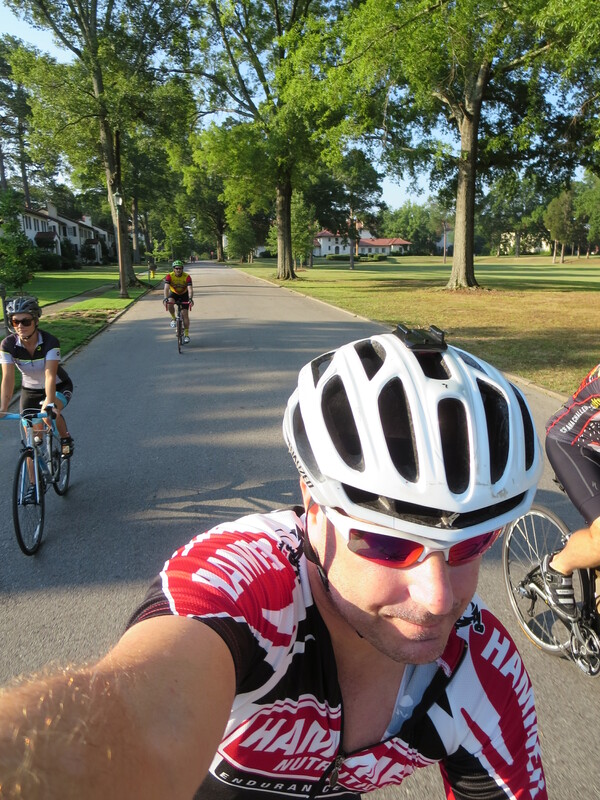 Catastrophe averted, I donned chip and number, gathered myself and came to the start to look around at the perhaps 60 or so riders assembled. Yes, this would be a small ride indeed, especially since there was a 25, 50, 62 and 100 mile course. I was later to find out that there were 20 riders registered for the 100 mile. There were some lonely road miles ahead. If you’ve looked at the ride profile you’ve probably concluded, correctly, that this is not the most difficult of courses. With the exception of two significant climbs, Duggert Mtn and Bains Gap Rd, it’s all gently rolling, so I was cruising along nicely, knowing the real challenge would be later in the day with the two hills and the heat. I was very conscious to keep my effort pretty low and take a swig from my water bottles every 10 minutes. It was hot, but manageable, especially on the back roads which were nicely shaded with our 7:30 am start, so I was feeling pretty good as I got to mile 40 and rest stop #2. It was after this that things took a turn. A few hours in and the sun was much higher now, making shade much less abundant, even along the 20 miles of the Chief Ladiga Trail we rode. This, by the way is a phenomenal multi-use rail trail stretching from Anniston all the way to Smyrna, GA just northwest of Atlanta. The next few miles were a rapid and nauseating descent in to heat stress. I’ve had some heat issues in the past and once you have, you become particularly sensitive to them again. I was not expecting Duggert to be nearly as steep as it was and when it reached 11% grade I wasn’t sure which would happen first, my puking or my heart exploding, so for the second time in any of these state rides, I was forced off the bike to walk up the hill (the other was the 24% Lincoln Gap in Vermont). I was in bad shape. Light headed, nauseous, heart racing. Ah, my Garmin was only reading 102 degrees. At this point I was fairly certain my day was done. Especially with all the doom and gloom talk of the “big” climb yet to come at Bains Gap. Good thing the next two miles to rest stop #4 were pretty much downhill because I felt like CRAP having that well known internal self-argument between quitting and gutting it out. I think the volunteers were a bit concerned with how I looked when I coasted in, dropped my bike and stumbled under the pop-up to a chair and some shade. I spent a good 20-30 minutes there resting, drinking, holding ice to my head and neck and contemplating my next move. As my heart rate came down and I rested and drank I felt better and better. I’d driven 700 miles and ridden 69. That’s a lot of effort to quit at that point and in truth, by the time I left that rest stop I felt pretty good. I’d asked what was left ahead of me, knowing that Bains Gap was at mile 90 and a 3 mile climb, but after that, downhill into Anniston and a flat few miles to the finish. They told me it was mostly flat the 21 miles to the next stop and then took their opportunity to profess their own horror about the big climb. So I decided I would take my time and ease my way to the next rest stop and worry about the last bit once I was there. My keep was to keep my heart rate under control as I’ve learned this is the genesis of, “feeling like CRAP.” No matter what was ahead I was determined to keep it under 160 bpm. It turned out not to be what I would call “flat” but I managed to stick to my plan for the next 21 miles, taking it extremely slow and easy on the climbs and thanking the universe for every cloud that drifted in front of the blazing sun. When I go to the last rest stop at mile 90 I was fatigued, as you might expect after 90 miles on a bike, but certainly feeling MUCH better than when I arrived at the last stop. I spent an extended time resting and drinking at this stop too and was quite glad I had not thrown it all in. Between this stop and the last there were discussions between the volunteers, myself and the two other riders who were a bit behind me and catching up at each stop. We learned that 20 riders had started the 100 miles, three had passed through the stops ahead of us and allegedly 12 had dropped out of the ride. Tough conditions indeed. I finally headed off on the final 11 miles, knowing I’d make it, even if I had to walk up this mountain in front of me. All the doom and gloom was for naught, however. The road climbed gently at first and steadily increased over the next couple of miles. The big white puffies in the sky kept the sun hidden away and having just rested I was able to move along, a bit more slowly than normal, but at an acceptable effort. The climb does suddenly ramp up to double digits and maxed out around 17%. By this point my pedal cadence was down to 35-40 rpm, just barely enough forward motion to stay upright. In fact on one stroke I popped a mini-wheelie and nearly fell over, so had to turn perpendicular to the hill to get started again, where I missed my clip-in and nearly fell over again. Third times a charm and as I came around the bend I was rather shocked to find myself only a few dozen yards from the top. In all, the really steep part was barely a half mile. A steep half mile, but thankfully short! Whew! After a fab downhill it was apparent the clouds were all on the other side of the mountain and the last 7-8 miles were a weaving, blazing slog as I limped to the finish, never so happy but too drained to appear even slightly joyous to be at the end. I’m told the weather was unusually hot and brutal and many thought they may move this back to the spring as it had been in the past. 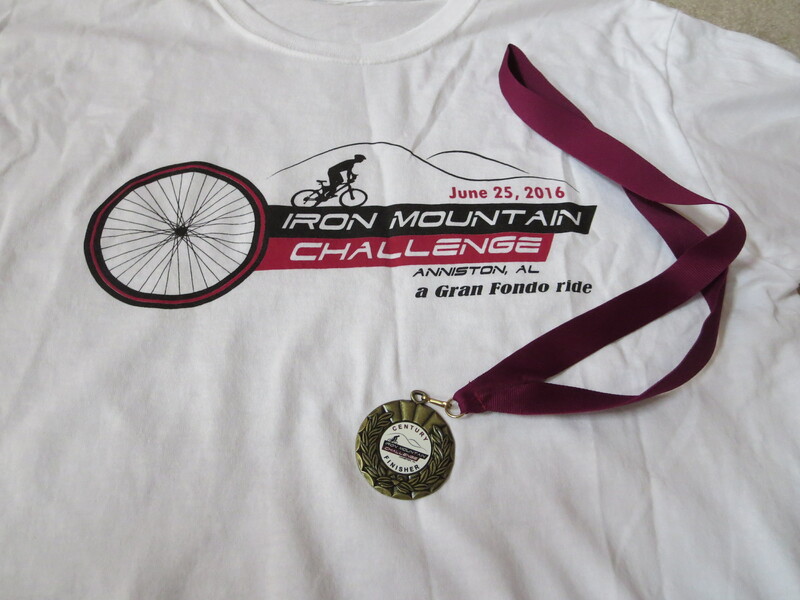 I drove 700 miles and endured brutal temps to be damn sure I got my shirt and medal. I celebrated that night with an wonderful dinner at the best restaurant in Anniston, which included the most fantastic Fried Green Tomato salad and Shrimp and Grits I’ve ever had. If you’re ever there, be sure to eat at Classic On Noble. 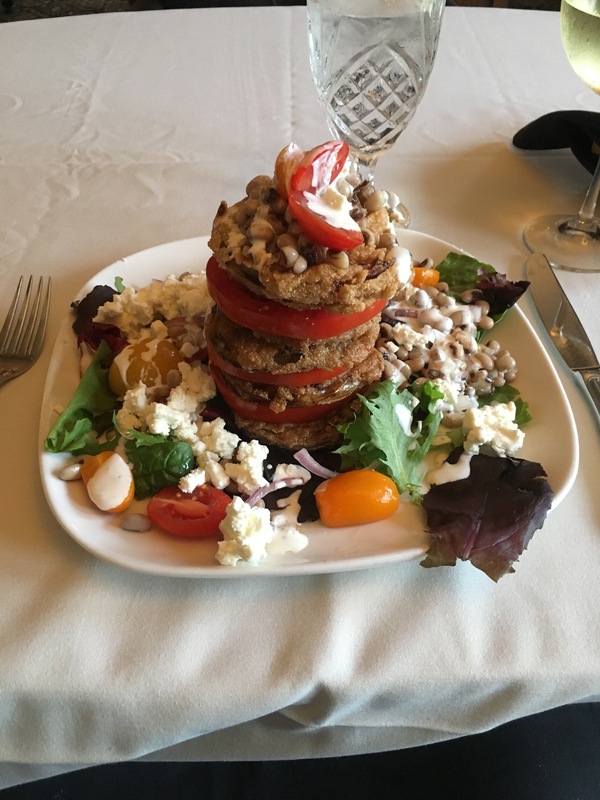 Fried Green Tomato Salad, uh, YUM!!! This is a good ride. It’s well organized, the volunteers were absolutely fantastic, it’s got great support from the city, including police support at all the major road crossings and the start/finish is a great venue, complete with free showers. A bit out of the way to get to, but if you find yourself in the Atlanta/Birmingham area, it’s a good one. 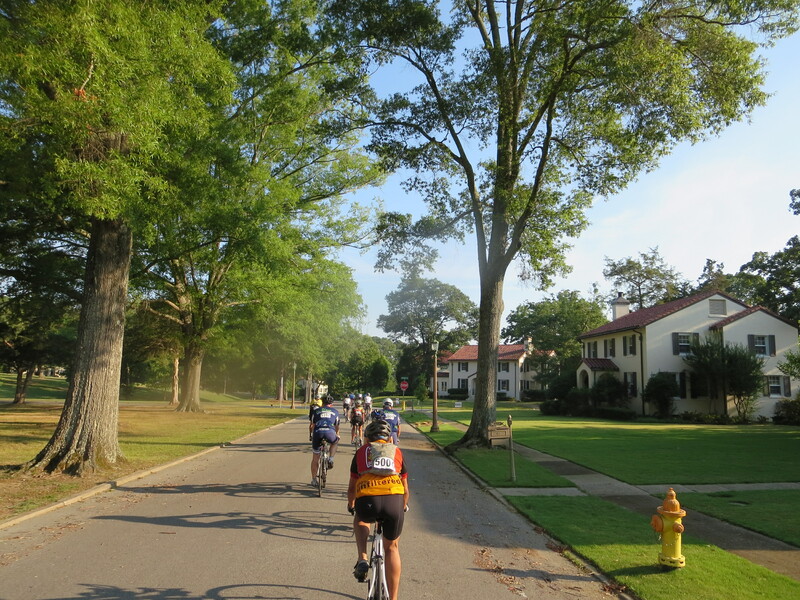 This entry was posted in Uncategorized and tagged 50 Rides In 50 States, Alabama, Anniston, Bicycling Events, Iron Mountain Challenge on June 27, 2016 by PR-Bike.